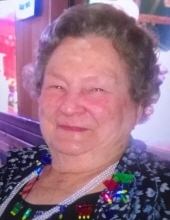 Dorothy M. Robins, age 93, resident of Houston, Texas, formerly of Tonkawa, OK passed away Monday, August 28, 2017. Friends and loved ones may pay their respects at the funeral home from 4-8pm Friday, September, 1, 2017. A funeral ceremony to celebrate her life will be held at 2:00 pm, Saturday, September 2, 2017 at the Trout Funeral Home of Tonkawa with Pastor Mark Busch officiating. Dorothy will be laid to rest next to her late husband Clarence at the Blackwell Cemetery. Arrangements are under the direction of Trout Funeral Home & Cremation Service of Tonkawa. Dorothy was born on May 17, 1924 to Joseph Brown and Irene McCain Brown in Tonkawa. She was raised in the Tonkawa area, graduating high school from there in 1942. Following high school, she was married to the love of her life Clarence Robins on September 15, 1946. Their marriage was blessed with three daughters. Before moving to Houston, Dorothy was a member of the Christian Church in Tonkawa. Camping out was a favored activity of Dorothy and Clarence. Spending their winters at the Trophy Gardens RV Park in Alamo, TX for 21 years. During the summers, they traveled all over the U.S. seeing the sights of this beautiful country. Survivors include her daughters, Barbara Robins of Houston, TX, Marilyn Rainbolt and husband Dwayne of Winslow, AR, son in law Alan Howeth of LA, grandchildren: Jill Inman and husband Kelly of Olathe, KS, Doug Howeth and wife Jennifer of San Antonio, TX, Frank Rainbolt and wife Amanda of Tulsa, OK, Carri Warren and husband Kendall of Stratford, OK, and Rusty Rainbolt and wife Stephanie of Winslow, AR. great grandchildren: Presley Howeth, Evie Rainbolt, Wyatt Rainbolt, Abby Inman, Zach Inman, Garrett Warren, and Logan Warren, several beloved nieces, nephews and dear friends. Memorial Contributions may be made to the Tonkawa High School Alumni Scholarship Fund, P.O. Box 12, Tonkawa, OK 74653. To send flowers or a remembrance gift to the family of Dorothy Robins, please visit our Tribute Store. "Email Address" would like to share the life celebration of Dorothy Robins. Click on the "link" to go to share a favorite memory or leave a condolence message for the family.